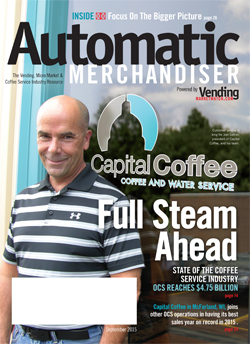 At Capital Coffee, it’s our goal to provide Madison and Milwaukee-area offices with the finest coffee brewing equipment available -- that’s why we’re proud to include Keurig single-cup coffee makers in our wide selection of office coffee systems. Keurig coffee systems use the innovative K-Cup brewing method to allow users to select their favorite coffee brand and blend from the hundreds of available gourmet options, including Green Mountain Coffee Roasters, Bigelow Teas and Van Houtte Coffees. K-Cups seal in freshness and flavor to deliver delicious coffee from the convenience of your office breakroom -- all at the push of a button! Unsure which single-cup brewer is right for your office? Capital Coffee has a solution for every workplace -- no office is too large or too small! We offer reliable, attentive service and custom office coffee programs to meet a range of needs. Get started today! Contact us to learn more about our Keurig one-cup coffee brewers. It’s our pleasure to introduce you to Capital Coffee, the pioneer and industry leader in “one cup at a time” coffee brewing technology. Serving Milwaukee, Madison and southern Wisconsin since August 1996, our goal is to provide customers with superior quality coffee and refreshment programs supported by customer service that sets the industry standard. The Keurig B3000 SE is a single-serve coffee system that can brew a cup in as little as one minute. It is designed for large offices that have 30 or more employees. This office coffee system is equipped with K-cup and mug sensors to prevent accidental brewing. 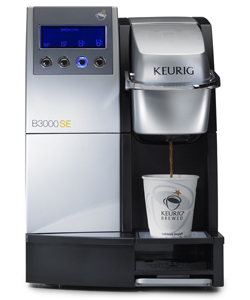 Click here for more detailed information on the Keurig B3000 SE single-cup coffee brewer.